Copyright © 2013 Sayyada Ghufrana Nadeem et al. This is an open access article distributed under the Creative Commons Attribution License, which permits unrestricted use, distribution, and reproduction in any medium, provided the original work is properly cited. The transition of C. albicans from unicellular yeast form to filamentous form i.e., pseudohyphae and hyphae is referred to as morphogenesis. C. albicans has the ability to respond to environmental conditions and accordingly changing its cell morphology. 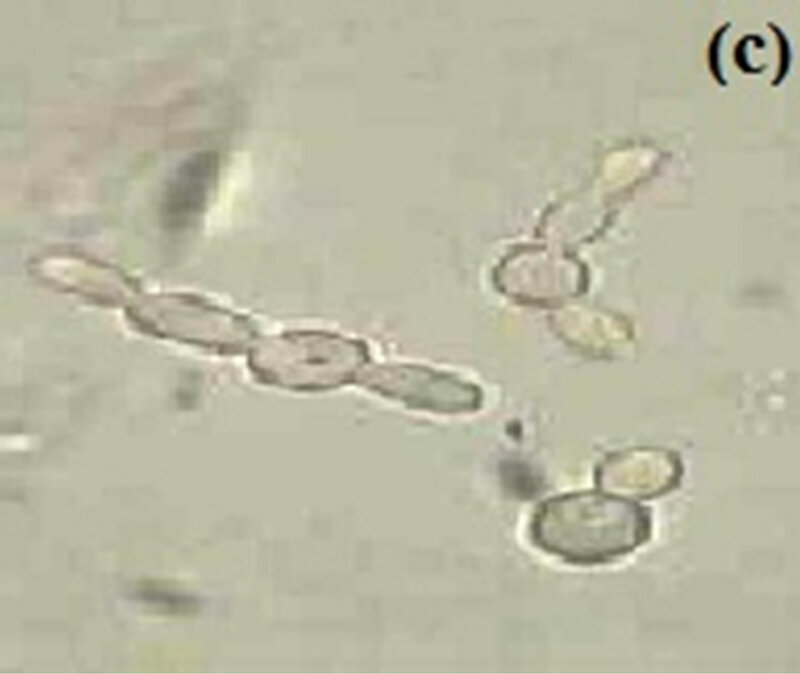 Three main morphological forms of C. albicans are unicellular yeast, pseudohyphae and hyphae. The effect of different growth media (Horse serum medium, RPMI-1640, MSGB), incubation temperatures (34˚C, 37˚C, 40˚C) and pH values (5.4, 6.4, 7.4) on germ tube production by C. albicans was evaluated. Horse serum medium noticeably promotes filamentation while RPMI-1640 medium shows moderate filamentation and MSGB media shows moderately low filamentation. The germ tube of C. albicans developed early in 1.5 hr at high temperature i.e., 40˚C. Incubation temperature of 37˚C was associated with highest germ tube formation while 34˚C shows low filamentation. A pH of 5.4 also induces low filamentation, pH 6.4 gives moderately lower than pH 7.4. A pH of 7.4 was best suited for germ tube induction. The peak of mycelium production appears between 1.5 and 6 hr after inoculation of C. albicans culture. These results suggested that environmental factors are important in selectively favoring yeast or hyphal form, most important being the growth medium, incubation temperature and external pH value. Candida albicans is the opportunistic fungal pathogen that lives as commensal on different locations of human body such as in gastrointestinal and genitourinary tracts in about 70% of humans. However, it can convert from harmless commensal into disease causing pathogen in response to change in host environment. C. albicans is the most common fungus associated with human infections, especially in immune compromised patients . Broadly, the infections caused by C. albicans can be divided into two categories: mucosal and systemic. Mucosal infections affect various mucous membranes of the body surfaces such as oropharyngeal mucosa and vaginal mucosa. Vaginal candidiasis is quite common in women and approximately 75% of all women suffer from vaginal candidiasis once in their lifetime. Systemic infection involves the spread of C. albicans to the blood stream and to the major organs. Mucosal infections of C. albicans are often benign but systemic infections are usually fatal [2-6]. Morphogenesis is an essential trait in the pathogenic fungus C. albicans and it is clearly required for virulence [7-11]. Morphogenesis in C. albicans is defined as transition from unicellular yeast form to filamentous form (pseudohyphae or hyphae) . It can grow in a variety of morphological forms such as yeast, pseudohyphae and hyphae [13,14]. 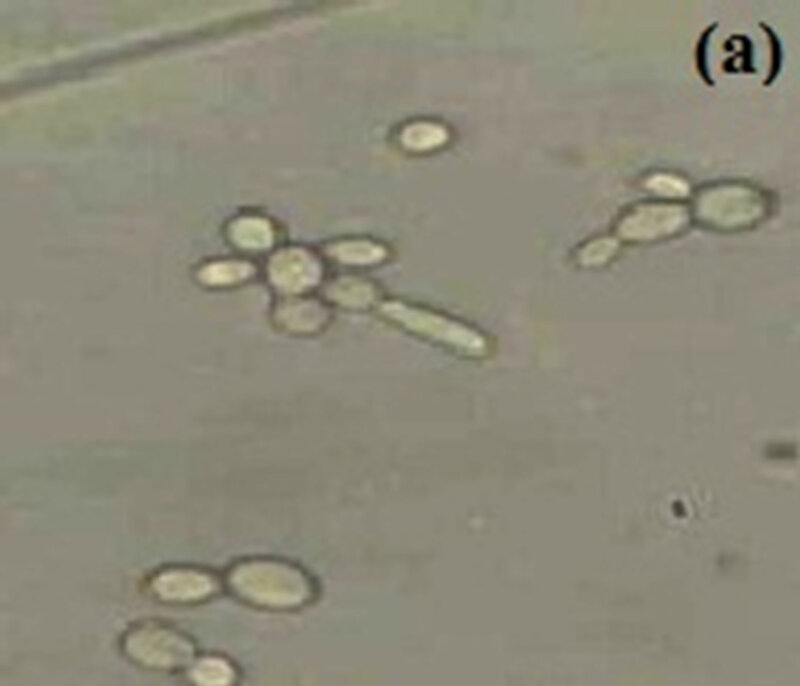 C. albicans also can form chlamydospores that is to say; thick walled spherical cells or asexual spores which develop over pseudohyphal support cells and appear under unfavourable environmental conditions [13,15]. In pseudohyphae daughter bud elongates and, after septum formation, the daughter cell remains attached to the mother cell. The elongation of buds in pseudohyphae can be so extreme that these filaments can superficially resemble hyphae. Because of this, it is often useful to be able to refer to pseudohyphae and hyphae collectively and we will use the term ‘filamentous’ for this purpose . However, hyphae are narrower than pseudohyphal cells (2 mm) and have parallel walls with no obvious constriction at the site of septation . Germ tubes are the initial projections observed when C. albicans switches from yeast form to hyphal growth . Growth is polarized in C. albicans hypha, with continuous apical growth throughout the cell cycle and parallel cell walls at the septal junctions. In contrast, the growth of pseudohypha and blastophores is only limited to the apical tip during the initial part of the cell cycle . Pseudohypha can also be distinguished from true hypha on the basis of their morphological index which quantifies the dimensions of cell compartments. Alternatively they can be distinguished on the basis of the positions of their septal junctions. These lie at the bud neck for pseudohypha, and within the germ tube for emerging hypha . Hyphae, pseudohyphae and yeast differ from each other in the rate and order of cell cycle events . Morphogenesis is interrelated to the pathogenesis of C. albicans. Adherence has been shown to play critical role in the pathogenesis of infections. Germ tubes, that are short hyphal elements, are important in the adherence of organism to the host epithelium [19-21]. Hypha of C. albicans are also important for tissue destruction and host invasion . The yeast form of C. albicans also have virulence attribute and is thought to promote dissemination within the blood stream and establishment of infection at distant sites [8,13,23,24]. Several researchers have investigated that hyphal form is more virulent than yeast form [25-27]. The principal determinant in the development of disease is the ability of C. albicans to switch between yeast and hyphal forms rather than the individual morphologies . There are various host defense mechanisms against C. albicans infections which mainly include phagocytosis of fungal cells by the cells of innate immune system (macrophages and neutrophils). Phagocytic clearance of fungal pathogens may be considered to consist of four distinct stages; 1) accumulation of phagocytes at the site where fungal cells are located; 2) recognition of fungal pathogen by specific receptors ; 3) engulfment of fungal cells bound to the phagocyte cell membrane, and 4) processing of engulfed cells within phagocytes by fusion with lysosomal vesicles to form the phagolysosome . Yeast forms of C. albicans cells are more effectively engulfed by macrophages as compared to hyphal forms. Hyphal cells are engulfed at a slower rate than yeast cells. The delayed engulfment may result in the detachment of fungal cell . Furthermore, the yeast-form of C. albicans cells that are phagocytosed by macrophages switches to the hyphal form and escape the macrophages. This switching is particularly important in escaping the defense mechanism of the host . Morphological changes between the yeast and the various filamentous forms occur in response to alterations in the growth conditions. Parameters that promote hyphal development in vitro include a growth temperature above 35˚C, a pH greater than 6.5, nitrogen and/or carbon starvation, nonfermentable carbon sources, low oxygen concentrations, and a wide range of chemicals including N-acetylglucosamine, proline (and other amino acids) and alcohols. Serum is one of the most potent inducers of hyphal development [32-34]. The effect of serum is complex but it is proposed to act, in part, by conferring amino acid starvation . Two known inducers of hyphal formation, N-acetylglucosamine (GlcNAc) and proline, may contribute to the serum effect since they are generated by degradation of serum (glyco-) proteins . It is well established that a pH around neutrality favours hyphal development of C. albicans in vitro, while a low pH (pH < 6.5) blocks hyphal formation and stimulates growth of the yeast form . Growth of cells in the yeast form is promoted by the inoculums above 106 cells/ml, a growth temperature below 35˚C, a pH of less than 6.5, glucose and ammonium salts . Compared to liquid medium, induction on solid media appears to represent a weaker hypha-inducing condition, because minor defects in filamentation show a defective phenotype on solid but not in liquid media . So the mycelial tendency is stronger in liquid than on solid media  and stationary phase cells are most responsive to hyphal and pseudohyphal induction signals . The present work is done to study yeast to hyphal transition as influenced by growth media, temperature and external pH value. Different growth media are used to study the nutritional effect on C. albicans with respect to temperature and pH. Also effect of temperature and pH is observed individually. The culture of C. albican was kept on SDA at 4˚C. Culture from plate was inoculated in YEPD broth and incubated at 37˚C for 24 hrs. Yeast cells were washed twice by centrifugation with sterile water and resuspended in water. The turbidity of suspension was adjusted to 0.5 Mc Farland solutions (1 × 106 to 5 × 106 CFU/ml). Three growth media were used to study their effect on morphogenesis. These were Horse Serum media, RPMI- 1640 and Modified Sabourauds Glucose broth (MSGB). The Horse Serum media contain the following: 900 ml of Yeast Extract Peptone Dextrose broth (YEPD) and 900 ml of serum. YEPD is first autoclave, cool and then serum was added to it. The final pH of the media was 6.8. RPMI-1640 media contain the following (per 1000 ml of distill water: Inorganic Salts (100 mg of Ca (NO3)2·4H2O, 400 mg of KCl, 48.80 mg of MgSO4, 6000 mg of NaCl, 800 mg of Na2HPO4 and 2000 mg of NaHCO3), Amino acids (200 mg of L-arginine, 56.82 mg of L-asparagine. H2O, 20 mg of L-aspartic acid, 65.20 mg of L-cystine. 2HCl, 20 mg of L-glutamic acid, 300 mg of L-glutamine, 10 mg of glycine, 15 mg of L-histidine, 20 mg of hydroxy-L-proline, 50 mg of L-isoleucine, 50 mg of Lleucine, 40 mg of L-lysine. HCl, 15 mg of L-methionine, 15 mg of L-phenylalanine, 20 mg of L-proline, 30 mg of L-serine, 20 mg of L-threonine, 5 mg of L-tryptophan, 28.83 mg of L-tyrosine. 2Na·2H2O and 20 mg of Lvaline), Vitamins (0.20 mg of biotin, 0.25 mg of D-calcium pantothenate, 3 mg of choline chloride, 1 mg of folic acid, 35 mg of i-Inositol, 1 mg of nicotinamide, 1 mg of p-aminobenzoic acid, 1 mg of pyridoxine. HCl, 0.20 mg of riboflavin, 1 mg of thiamine. HCl and 0.05 mg of vitamin B12) and others (2000 mg of D-glucose, 1 mg of glutathione and 5 mg of phenol red). The final pH of the media was 7.4. MSGB media contain the following (per 1000 ml of distill water): (10 g of peptone and 2 g of D-glucose). The final pH of the media was 7.4. Media were warmed to their incubation temperature before inoculation . Inoculate 1 ml culture in 9 ml media. After inoculation of culture, the tubes were kept in water bath shaker at 37˚C for 12 hrs. C. albicans was inoculated in MSGB media under pH 7.4 and incubated at different temperatures of 34˚C, 37˚C and 40˚C for 12 hrs. The influence of pH was observed by inoculating culture in MSGB media under different pH values of 5.4, 6.4 and 7.4 providing incubation of 37˚C for 12 hrs. At intervals (1.5 hr) during growth, the cell concentration was determined using hemocytometer. Yeast cell buds emerging from mother cells are counted as a separate cell if the bud is at least one-half the size of the mother cell . Count the cells forming germ tube and express this as a percentage . 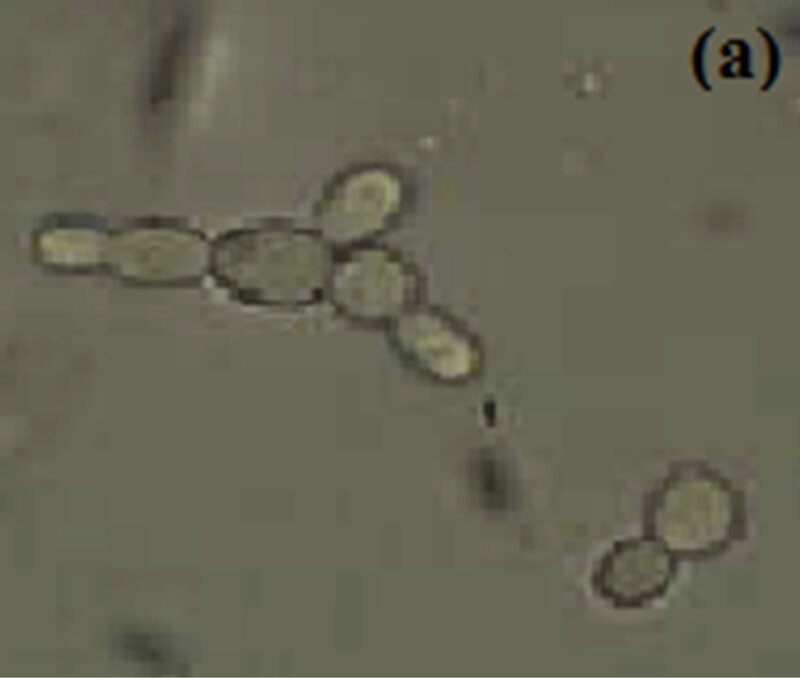 C. albicans is the most frequent opportunistic fungal pathogen of humans. One of the major virulence factors is its ability to switch between yeast and filamentous form. C. albicans morphogenetic conversions are important for multiple aspects of C. albicans biology and pathogenicity. Environmental factors are vital for control of the morphology of C. albicans and a wide variety of environmental factors is responsible for this morphological transition. Most important factors are the growth temperature of 37˚C, neutral pH, growth medium, carbon starvation, low oxygen concentration and a wide range of chemicals including N-acetylglucosamine, proline (and other amino acids) and alcohols . These individual or combinations of factors are responsible for the transition of C. albicans from yeast to filamentous form. The combined effect of temperature 37˚C and a neutral pH have been observed in a number of past studies [41-43]. In the present work effect of growth medium, pH and temperature is observed. The effect of pH was observed while keeping the temperature constant at 37˚C. Similarly, the effect of temperature was observed while keeping the pH constant at 7. The three growth media used for inducing filamentation in C. albicans were Horse serum media, RPMI-1640 and Modified Sabouraud’s Glucose Broth (MSGB). These growth medium were tested for observing the effect of nutrients on morphogenesis in C. albicans. The importance of nutrient factors that induce germ tube formation in C. albicans has been reported in previous papers [44-47]. Figure 1. 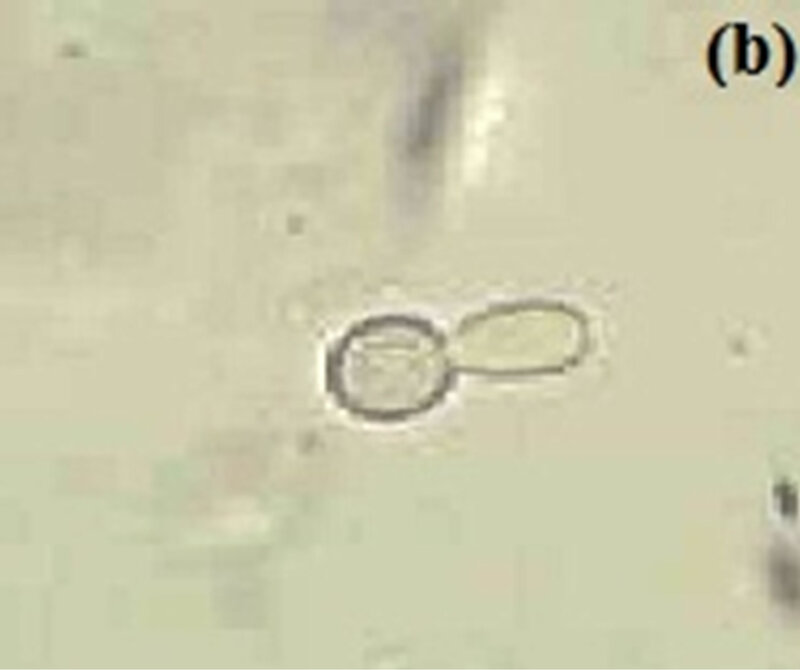 Formation of germ tube in C. albicans after 4.5 hr at 37˚C in (a) Horse serum, (b) RPMI-1640 and (c) MSGB magnification: 40×. Table 1. Effect of different growth media in germ tube production in Candida albicans incubated at 37˚C for 12 hr. 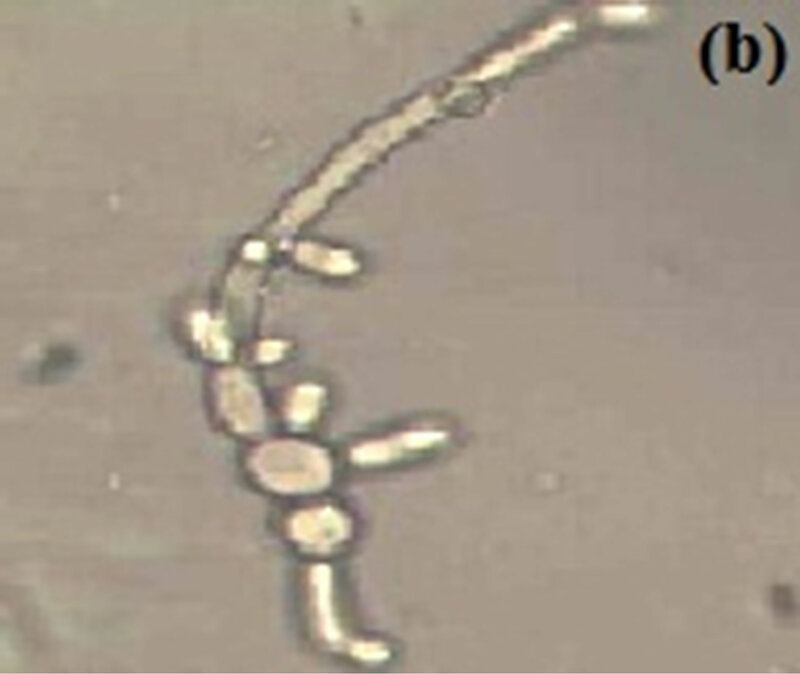 filamentation of C. albicans has also been reported in a previous paper . MSGB used here shows 40% filamentation after 4.5 hr of inoculation of culture. It gives comparable low filamentation than RPMI-1640 media. The effect of different temperatures i.e., 34˚C, 37˚C & 40˚C were used to detect germ tube formation in C. albicans keeping pH 7 of the medium. 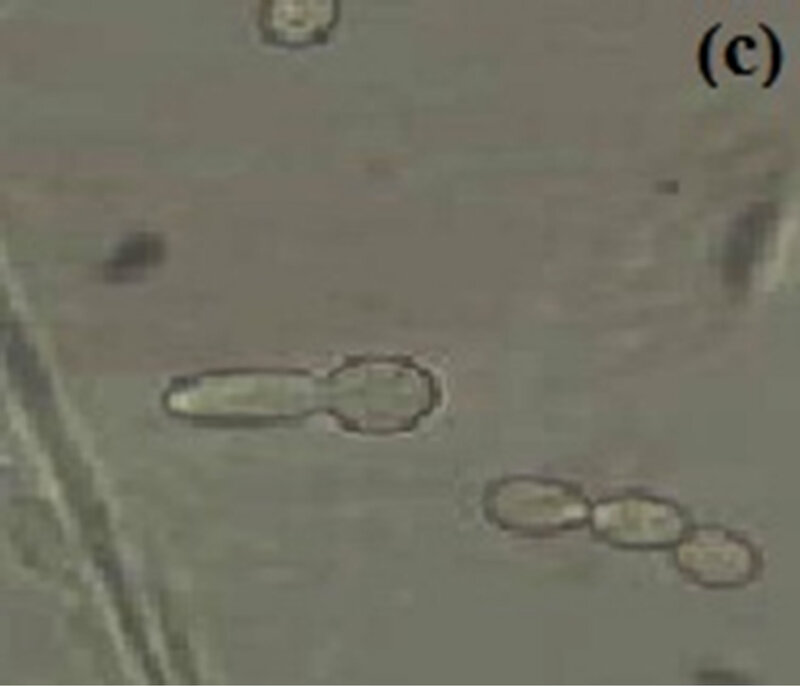 Hyphae are readily induced from unbudded yeast cells by a growth temperature of 37˚C  and according to the previous paper  37˚C was optimal for filamentation, 34˚C was suitable while higher temperature results in gradual decrease in yeast growth. In the experiment performed no filamentation seen at 34˚C after 1.5 hr while 14% filamentation seen after 4.5 hr (Figure 2(a)), at 37˚C 42% germ tube formation seen after 4.5 hr (Figure 2(b)) while at 40˚C rapid germ tube formation (28%) seen after 1.5 hr. (Figure 2(c)) and peak filamentation (about 36%) seen after 4.5 hr (Table 2). The influence of incubation temperature in dimorphism of C. albicans has been reported by many workers [5,36,50,53,54]. In the experiment performed, effect of different pH values i.e., 5.4, 6.4 and 7.4 were used to study germ tube formation in C. albicans keeping the temperature constant at 37˚C (Figure 3). The peak germ tube formation was seen at pH 7.4 and about 40% cells form germ tube after 4.5 hr of culture inoculation (Table 3). It was also reported that the extracellular pH is one of the environmental factors that modified the physiology of the cell . Moreover, the combined effect of growth temperature and pH in the induction of hyphae and pseudohyphae has also been observed previously . The optima for filamentation in C. albicans are pH 7 and 37˚C temperature. However, increase in either parameters between these optima or parameter limits result in significantly low or no filamentation . When cells are released into fresh media at 37˚C but at pH 7, the cells are synchronously evaginated to form germ tube. These cell cultures continue to grow as mycelia form as long as pH is 7 and temperature is 37˚C. The peak of germ tube production by C. albicans appeared between 1.5 to 6.0 hr observed in different growth media and at different temperature and pH values and it gradually decreases after 6.0 hr. However, it was also observed in most of the cases that after decrease in % of CFGT, it starts to increase after 10.5 hr. The reason behind may be that the effect of growth medium, temperature and pH that should be determined at regular intervals in 12 hr a day  is not done so as it is not possible, therefore, the experiment was splitted in to two days and observations were taken at regular intervals in 6 hr a day. Therefore, fluctuations in percentage of cells forming germ tube may be seen most of the time. Figure 2. 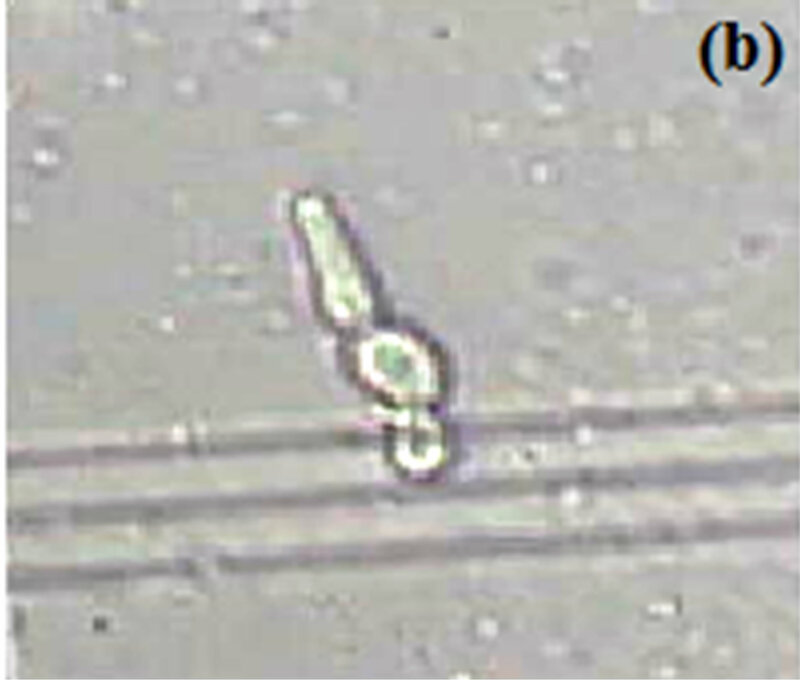 Short outgrowth from budding yeast is seen after 4.5 hr in MSGB at (a) 34˚C, long filament seen at (b) 37˚C and a germ tube after 1.5 hr at (c) 40˚C. Magnification: 40×. Figure 3. Budding yeast and pseudohyphal cell at 37˚C in MSGB under (a) pH 5.4, short elongation from yeast cell under (b) pH 6.4 and a comparable long germ tube under (c) pH 7.4. Magnification: 40×. Table 2. Effect of incubation temperature in germ tube production in Candida albicans. Table 3. Effect of pH values in germ tube production in Candida albicans cultivated in MSGB at 37˚C for 12 hr. of incubation. means of surviving under unfavorable conditions. 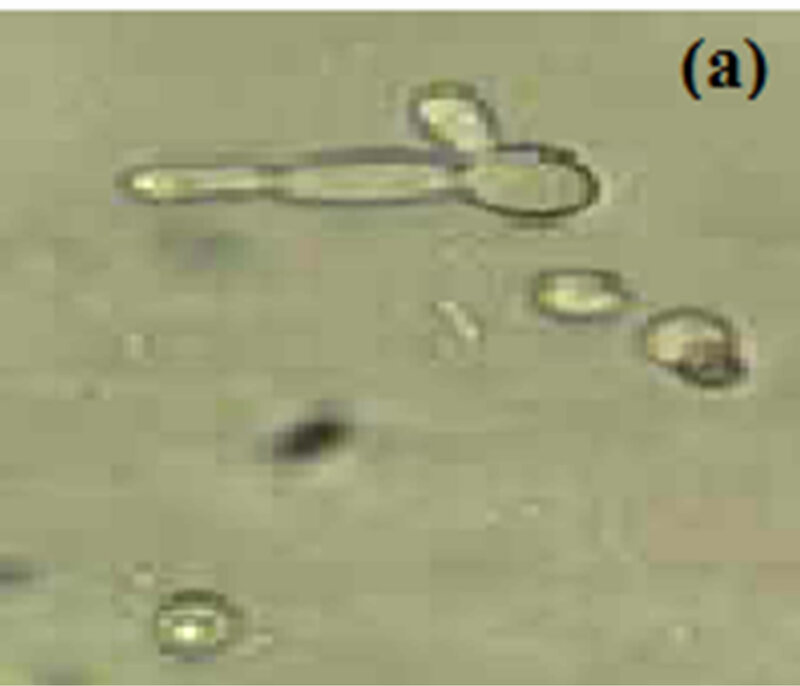 Therefore, morphogenesis in C. albicans is considered important in its pathogenesis. 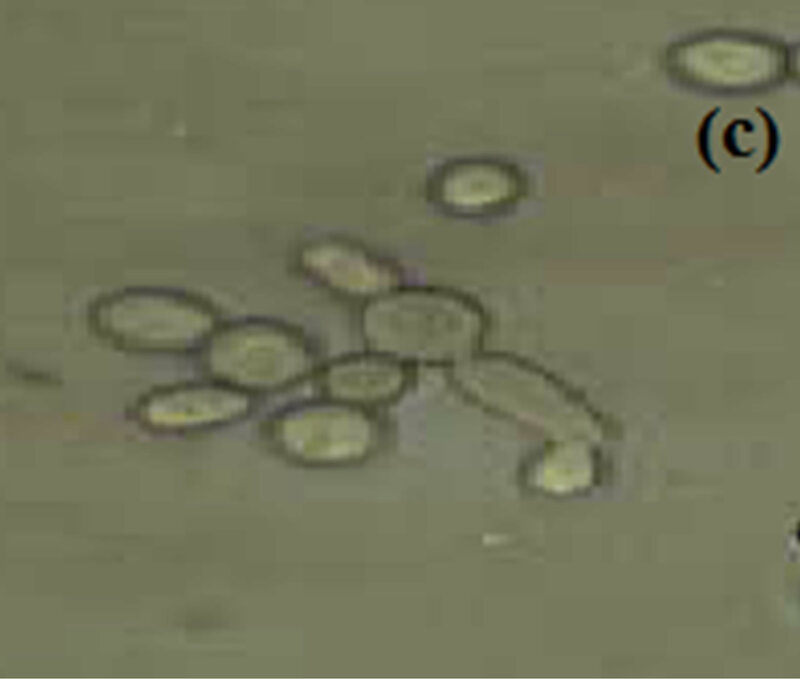 Several experimental approaches have been applied to the investigation of morphogenesis in C. albicans. The principal objective of research on morphogenesis in C. albicans is to define and analyze the expression of molecules that determine cell shape .